The family of Proteaceae in general is called Feather-Bushes or Sugar-Bushes and principally endemic to South Africa and Australia. The largest distribution of species lies in the wider area of Cape Hope, where numerous species occurr from sea-level to higher elevations in mountain regions at up to 3.000m, such as the Drakensberge (Dragon Mountains). An unique ecosystem is located at this altitude, the so called Fynbos, a name which literally means "fine bush", as many species have fine and narrow leaves. The Fynbos hosts uncountable grasses, various genera related to lilies and iris and - above all - several showy members of the Proteaceae. 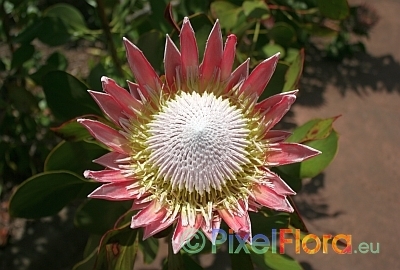 Probably the most eye-catching genus of all Proteaceae is Protea itself. Therein the "King Protea" (Protea cynaroides) is the best known species with some amazingly large, very nice colored and long lasting flowers above leathery, evergreen foliage, which are often used in exclusive (and expensive) floristry arrangements. Another genus with several species that have utmost showy, long lived flowers is Leucospermum (Pincushion Proteas). Most Pincushion Proteas make excellent pot plants as they do not become too large. - soaking seeds in warm water for some 24h, to which a good portion of wood ashes (some 3 ts per 100ml of water) is added, e. g. from your last barbecue. Do not use cigarette ashes, as the nicotine will severely damage the seedlings! - soaking seeds in a 1:2 solution of hydrogen peroxide (H2O2) in water for some 30min prior to sowing. This bleaching and desinfecting liquid is available from your local pharmacy store, usually sold as Hydrogen Peroxide 10 vols. It is important that the substrate drains well and that at the same time seedlings will not dry out easily in between watering intervals. Plant seeds to a depth equal to their size and water thoroughly. Keep sowing pots in partial shade, and in a spot with some good protection against mice, birds, squirrels, as well as large insects. Regularly water as soon as the soil starts to fall dry. The germination period varies from 3 weeks to 3 months, depending on species. After germinaton the cotyledons appear first, and after that the first true leaves emerge. Once the true leaves appear, seedlings shall be exposed to full sunlight (especially in winter months!). Carefully unpot seedlings as they are strong enough after some 6 months. Take special care in not breaking too many fine roots, as all Proteaceae greatly dislike a disturbance of their root system. 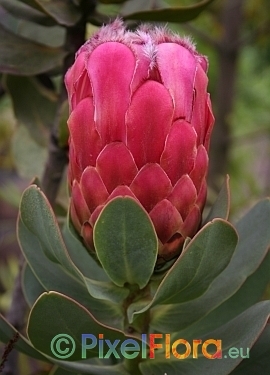 All Proteaceae are said to be rather difficult in cultivation, as they require some special cultivation methods which have to be provided in order to raise healthy plants, which will flower in cultivation as well, the first time approximatley some 5 years after sowing. However, once the basic rules of cultivation for these species are complied, they will turn out to be as easy as most other container plants - and their spectacular long-lasting flowers are definitely worth to give them a try! All species offered in our shop are native from higher elevations and are hardy to at least USDA Climate Zone 9 (equivalent to winter lows of some -7°C/20°F). They can be grown in the open garden if you are situated in a similar climatic zone. Choose any spot with a well drained and acidic soil in full sun. In any loam based garden soil, dig out a square hole of some 50cm in depth and fill it with a humus based substrate, such as peat moss with coarse sand or a well-matured compost mix in order to lower the pH-value. Mulching with well-rotted compost or wood chips helps keep down weeds, retains moisture, cools the roots and supplies some nutrients. In colder climates in Central Europe all Proteacea should be grown in pots or containers. Pots can be placed in the garden from April to end of October depending on night temperatures. Container plants like a medium-cold, frost-free climate and a sunny to partially shaded spot during winter (e.g. in a cold or semi-warm greenhouse) and should kept slightly drier, however the soil shall never dry out completely. The potting medium should be similar to the mixture you use for seed sowing, but it should contain some more draining material in order to keep the soil very well aerated. Also, plants will need some more nutrients to survive in the pot, thus increase the amount of peat or decomposed pine needles and add some well-matured compost. Since the Proteaceae are adapted to nutrient-poor conditions, chemical fertilizer or manure will burn their sensitive root system. Use an organic plant food such as a fish or seaweed emulsion or a chemical fertilizer especially formulated for orchids or bromeliads. Last but not least ensure that pots have enough drainage holes, and put a small layer of coarse material on their surface to keep soil open and well draining. During winter months keep plants under frostfree conditions at a minimum of some 5°C in full sun. Reduce watering to a minimum and provide a good air ventilation. Proteaceae are well-adapted to windy conditions in the mountains, and like to have free air circulation around them. Thus a good air ventilation is the key to success in over wintering all Protea inside. Provide fresh-air as often as outside temperatures allow it in order to avoid fungal infections and to keep their leathery leaves healthy. All information on this page is presented without any guarantee.